The Girl Scouts of the USA has issued a blistering rebuke of the Boy Scouts of America's decision to begin letting girls into the ranks of its troops. "The Boy Scouts' house is on fire," Girl Scouts told ABC News in a statement today. "Instead of addressing systemic issues of continuing sexual assault, financial mismanagement and deficient programming, BSA's senior management wants to add an accelerant to the house fire by recruiting girls." The criticism comes after the Boy Scouts of America said Wednesday it will allow girls to join the ranks of its Cub Scout program, as well as create a Scouting program for older girls. The Boy Scouts' program for older girls would allow them to reach the highest rank of Eagle Scout. It is expected to be formally announced next year and is projected to be available in 2019, the organization said. 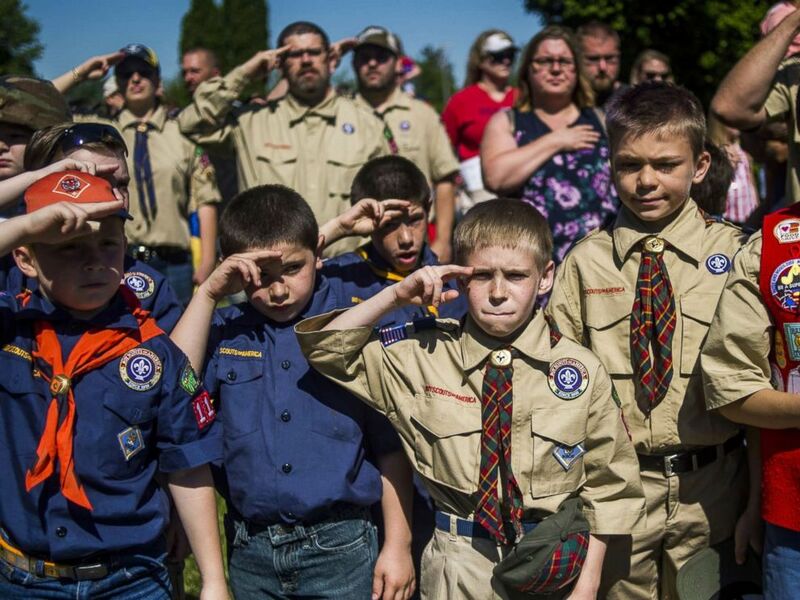 Boy Scouts and Cub Scouts salute during a Memorial Day ceremony in Linden, Mich., May 29, 2017. The Girl Scouts appeared to respond Wednesday to the Boy Scouts' decision with a blog post citing what it said is the power of the "single-gender environment." "Girl Scouts is the best girl leadership organization in the world, created with and for girls," the organization wrote in the post. "We believe strongly in the importance of the all-girl, girl-led, and girl-friendly environment that Girl Scouts provides, which creates a free space for girls to learn and thrive." It continued, "The benefit of the single-gender environment has been well-documented by educators, scholars, other girl- and youth-serving organizations, and Girl Scouts and their families. Girl Scouts offers a one-of-a-kind experience for girls with a program tailored specifically to their unique developmental needs." 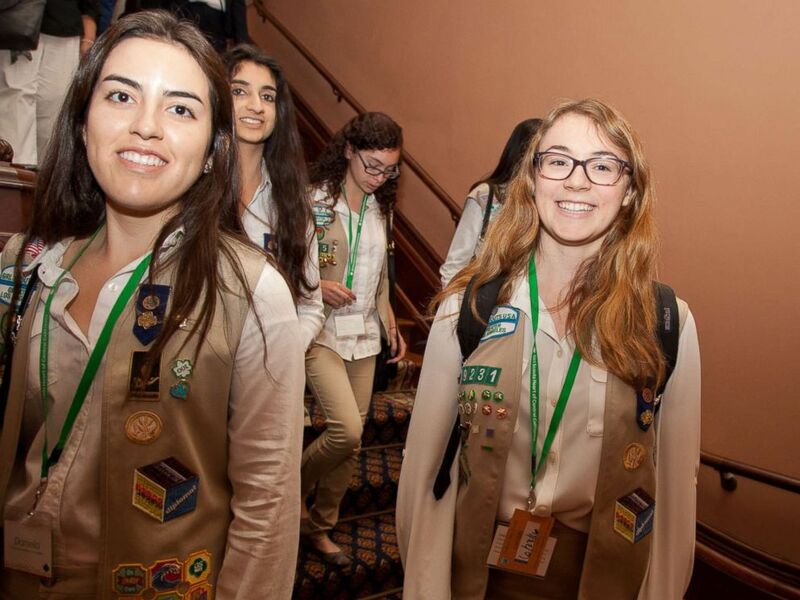 California Girl Scout Gold Award recipients Daniela Castro (L) and Sarah Gillespie (center) of Girl Scouts of Greater Los Angeles walk the halls of the State Capitol with their fellow awardees, on June 23, 2016, in Sacramento, Calif. Girl Scouts' highest achievement is called the Girl Scout Gold Award. The award is open only to girls in high school and requires a seven-step project to solve a community issue. The Girl Scouts organization, founded in 1912, has a membership of 1.8 million girls led by 800,000 adults, according to its website. The organization generates nearly $1 billion, half of its annual revenue, in sales from the famous Girl Scouts cookies. The National Council of the Boy Scouts of America reported about 2.3 million youth members and Explorers registered in individual programs with roughly 950,000 registered adult leaders, according to its 2015 annual report, the most recent available. Under the changes announced Wednesday, Cub Scout "dens," as they are called, will be single-gender, allowing the organization "to maintain the integrity of the single-gender model while also meeting the needs of today’s families," the Boy Scouts of America said in a news release. Girls will be allowed to join the ranks of Boy Scouts beginning in 2018. "The historic decision comes after years of receiving requests from families and girls, the organization evaluated the results of numerous research efforts, gaining input from current members and leaders, as well as parents and girls who’ve never been involved in Scouting -- to understand how to offer families an important additional choice in meeting the character development needs of all their children," the news release reads. The Boy Scouts of America "has offered co-ed programs since 1971 through Exploring and the Venturing program," Wednesday's news release noted.